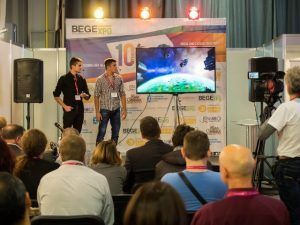 Accompanied by the magnificent sound of Bulgarian national pipes and drums, over 5 thousand professionals from the industry stepped inside the 10 th anniversary edition of the leading gaming event in Eastern Europe – BEGE Expo. The impressive performance of the folklore ansamble Chinary greeted the visitors and emerged them in the show. 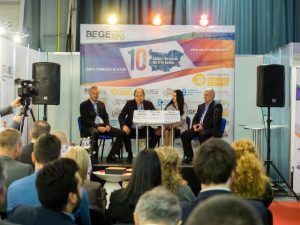 BEGE Expo is initiated by The Bulgarian Trade Association of Manufacturers and Operators in the Gaming Industry (BTAMOGI) and is supported by the Bulgarian State Commission on Gambling. The two-day program of the exhibition was tight with various events and accompanying activities. The humanoid robot Sanbot greeted the visitors at the opening ceremony of the event and set a tone of good mood, kept all through the trade show. 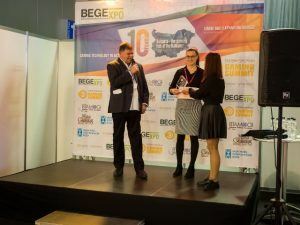 Later on the beauty contest Miss Gaming BEGE 2017 was held and the new beauty queen was officially selected at the BEGE party in the evening. The contestants were presenting the biggest operators, having locations in Bulgaria. The crown was given to the graduated economist Alexandra Peyovich, contesing on behalf of the Admiral casino.The runner ups were the girls presenting CGI Clubs and Eldorado Bet and the „Audience’s favorite“ was Sara Amar, selected by Casino Royale Palms. Moreover, the young entrepreneurs of the industry had also tribune and introduced their novelties during the Gaming StartUp Challenge. 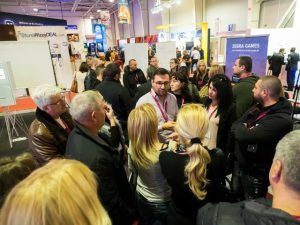 The jury, headed by the Executive director of Casino Technology – Ivan Tzankarsky, honored the company Zebra Digital with the 1 st place award in the contest for startup companies in the gaming field. The company has developed a concept for online games as a unique way of engaging prospects and generating new leads. The second place was for the Macedonians from Football Chat AI, who give football betting tips calculated with AI. The third place won the dark fantasy action-adventure video game of Incineration Productions. The second day concluded with the traditional discussion between operators and representatives of the Bulgarian State Commission on Gambling. 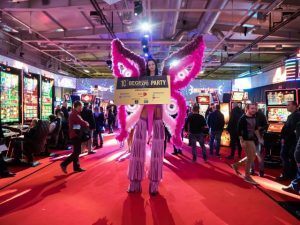 With the interest that exceeded all expectations and being a platfrom for extending the business relations and partnerships, the gaming trade show defined itself once again as the preeminent expo for the gaming and entertainment industry in Eastern Europe. 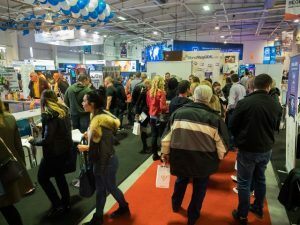 The floorplan for 2018 is almost fully booked already so stay tuned!